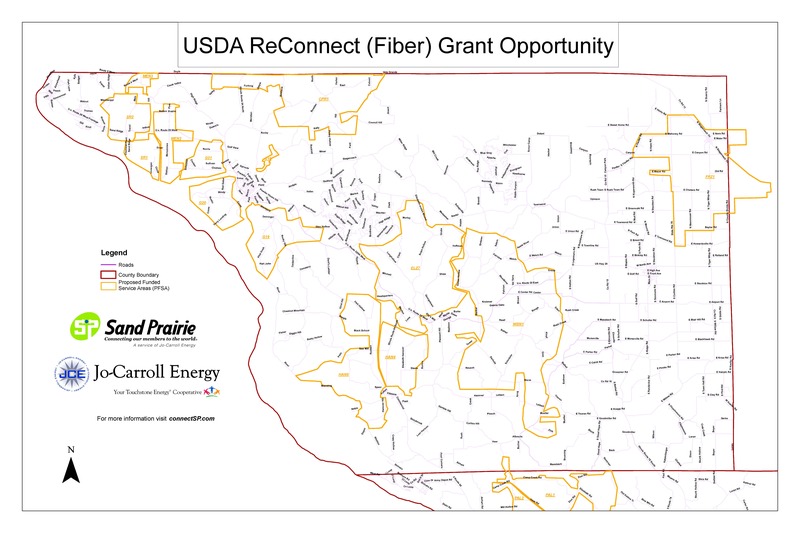 Sand Prairie, a service of Jo-Carroll Energy, is seeking funds available through the USDA’s ReConnect program that offers loans and grants to help build broadband infrastructure in rural America. Ultimately, the goal of the program is to connect rural communities to support agriculture production and marketing, e-Commerce, health care and education. Sand Prairie plans to apply for either a 100 percent grant or 50/50 grant and loan combination. The application will include 18 different proposed service areas in Jo Daviess and Carroll Counties. (See maps. )The proposed areas within each map are the result of a comprehensive vetting process to include eligible areas. Those areas not listed are most likely not in a qualifying area per the grant criteria. As part of the application, the cooperative needs to show support from farms and other businesses in the proposed service areas. The co-op is seeking the help of members, asking farms and rural businesses to complete Broadband Pre-subscription forms. Sand Prairie will receive one point for each farm or business that pre-subscribes up to a maximum of 20 points for farms and 15 points for businesses. The form is not a binding commitment. Forms are available at Jo-Carroll Energy offices in Elizabeth and Savanna as well as the Farm Bureau and FSA offices in Jo Daviess and Carroll counties. Forms can also be downloaded. Once completed and signed they can be returned to the co-op’s offices or mailed to: Sand Prairie, ATTN: T Tunks – USDA form, PO Box 390, Elizabeth, IL 61028. Projects funded through the ReConnect Program must serve rural areas and communities with fewer than 20,000 people with no broadband service or where service is slower than 10 megabits per second (mbps) download and 1 mbps upload. Approved projects must create access speeds of at least 25 mbps download and 3 mbps upload. Priority will be awarded for projects that propose to deliver higher-capacity connections to rural homes, businesses and farms. 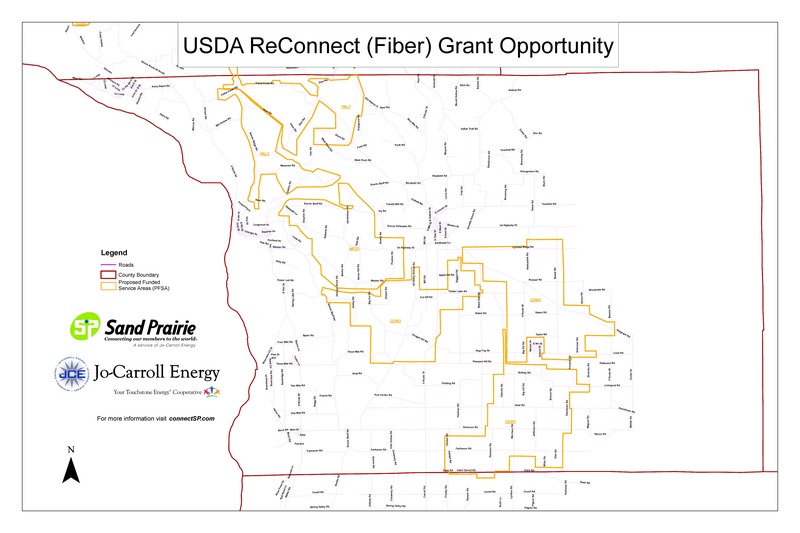 Sand Prairie’s fiber optic network proposed for these areas will be able to deliver speeds up to 1 gigabyte and is scalable for future expansion. Sand Prairie currently offers fiber internet packages with speeds of up to 250 mbps download and 25 mbps download. Sand Prairie fiber internet service is currently available in Elizabeth and portions of Galena. Construction projects slated for 2019 include neighborhoods in The Galena Territory and Apple Canyon Lake.